Prices have fallen to less than $US6,500 and are now at their lowest level since November. 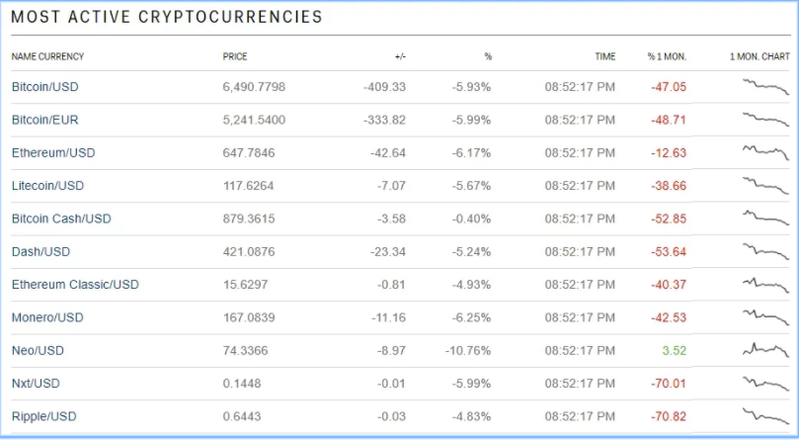 Other major cryptos have lost between 40-70% over the last month amid the global regulatory crackdown. Bitcoin is getting sold off in Asian trade, as regional stock markets crash in the wake of the Dow’s huge falls overnight. Cryptos saw a brief rally earlier this morning as US stocks got sold off into the close, with Bitcoin rising 6% from its intra-day lows to back above $US7,000. 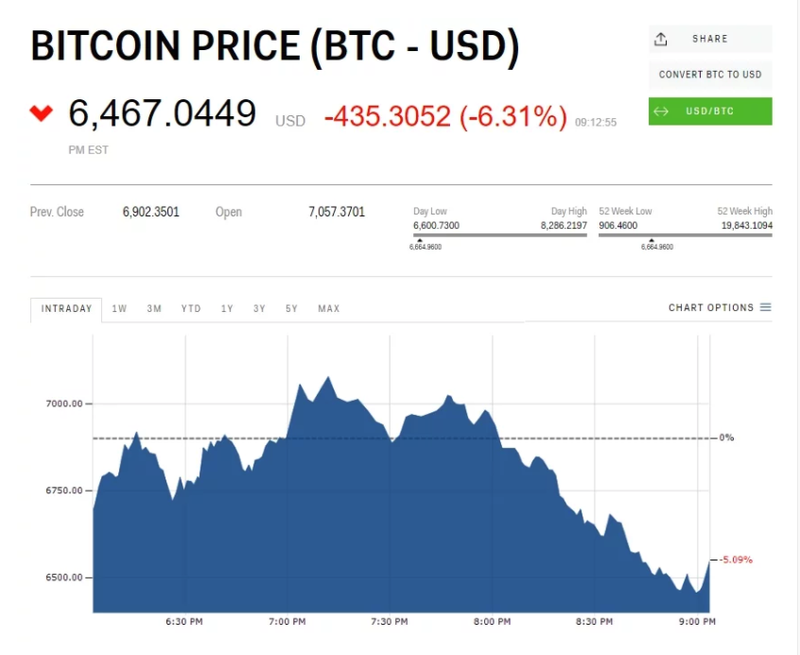 Bitcoin is trading at the lowest level since mid-November when a corresponding surge in Bitcoin Cash saw Bitcoin prices fall below $US6,000. Bitcoin Cash hasn’t been immune from the latest selloff and has fallen below $US1,000 — also for the first time since November. 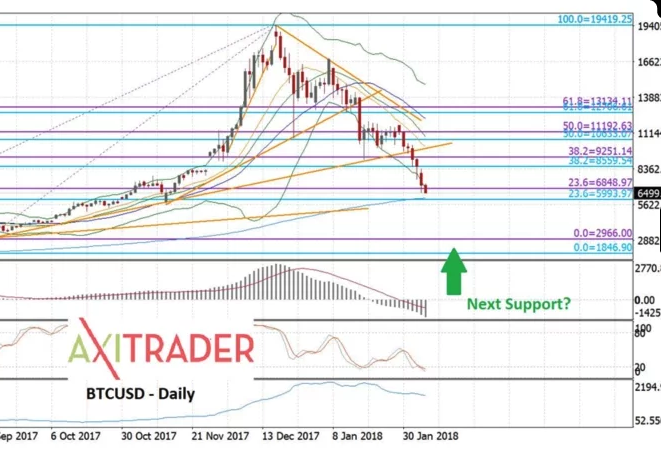 As Bitcoin continues to break through key technical support levels it indicates further falls to come, according to Greg McKenna from AxiTrader. “Increasingly this is looking like a falling knife no one wants to catch. And why would you right now? It’s not obvious what a circuit breaker to this weakness will be, or might emerge from,” McKenna said. The chart below illustrates McKenna’s view of the latest price action. “This could end up a full round trip back into the $US1850 / $US2966 region,” he said. Most of the other major cryptocurrencies have fallen by between 40-70% over the last month, amid increasing scrutiny from global regulators. Overnight, UK bank Lloyd’s announced that it would ban cryptocurrency transactions using credit cards from the bank. That followed reports from China that authorities have banned access to both domestic and foreign cryptocurrency exchanges. We nurture ideas, young business entrepreneurs with practical exercises and projects. District 1, Hồ Chí Minh City.